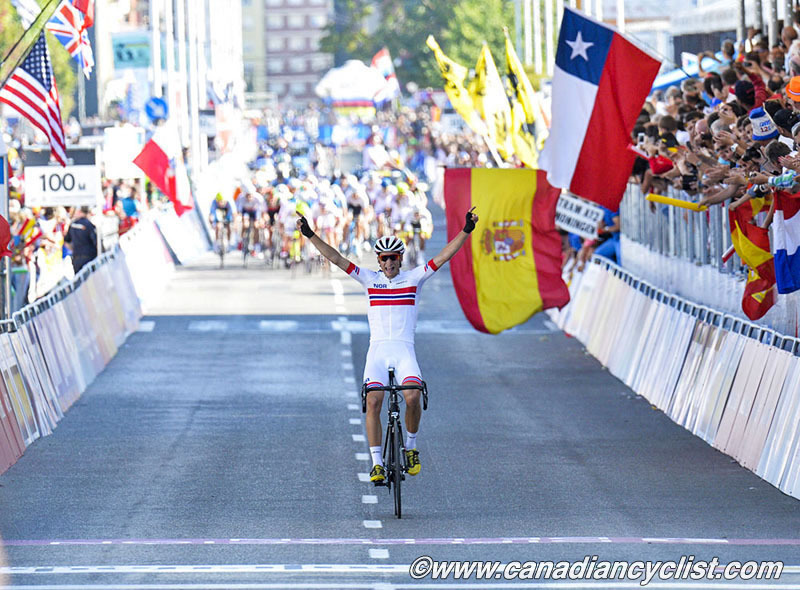 The first day of road races at the Road World Championships in Ponferrada, Spain, on Friday, saw Denmark and Norway win the Rainbow Jerseys in the Junior Women and Under-23 Men, respectively. 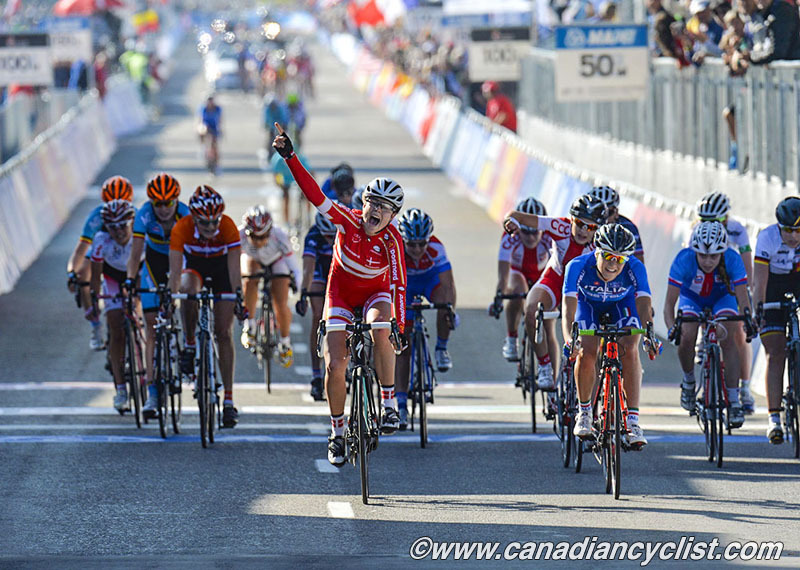 Canada's top performer was Emeliah Harvie, who finished with the front group in the Junior women's race, taking 19th place. 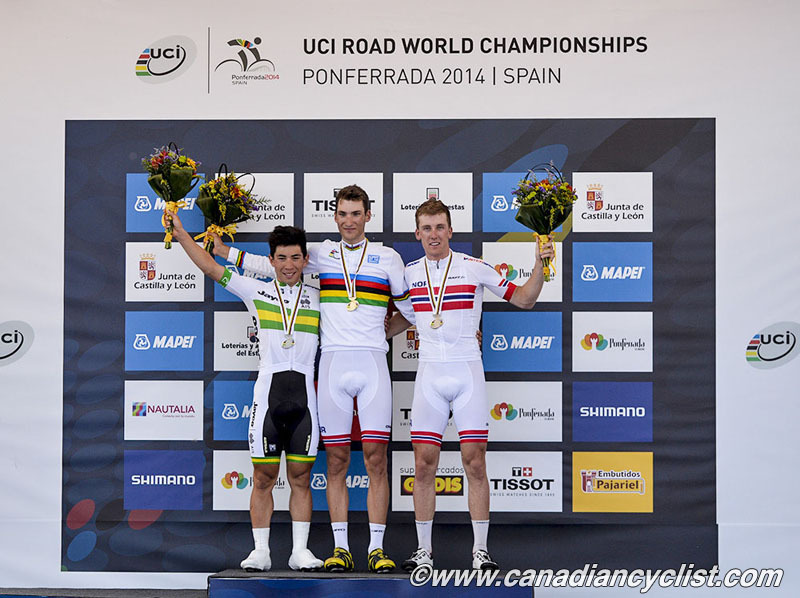 Canada did not qualify any spots for the Under-23 men's race. The same 18.2 kilometre circuit will be used for all the road races, with the Junior women completing four laps and the Under-23 men ten. The circuit starts by taking the riders through the streets of Ponferrada to the first short, steep climb, past an 11th century Templar castle. From there they head out of town to the main climb, which is not steep but ascends for nearly six and a half kilometres. The riders immediately drop down a steep, narrow twisty descent, with an abrupt right turn to cross a dam and go through a tunnel. They then hit a final two kilometres climb before another twisty descent back into the final kilometre and a half through town, with a sharp right 500 metres from the finish line. The women started in cold, single digit (Celcius) conditions, but the day steadily warmed, until the men were racing in heat. The women's race was one of attrition, with riders steadily dropping off the back in the four lap competition. Any attacks were quickly reabsorbed, setting the stage for a sprint finish. Defending champion Amalie Dideriksen of Denmark powered to the front from over 200 metres out to repeat as winner, with Italy's Sofia Bertizzolo taking silver and Agnieszka Skalniak (Poland) finishing third. The Canadian team had a mishap on the first lap, when Sara Poidevin crashed near the crest of the main climb. She took a while to get going, requiring Shimano neutral support, and could not regain the main bunch, eventually finishing 66th. 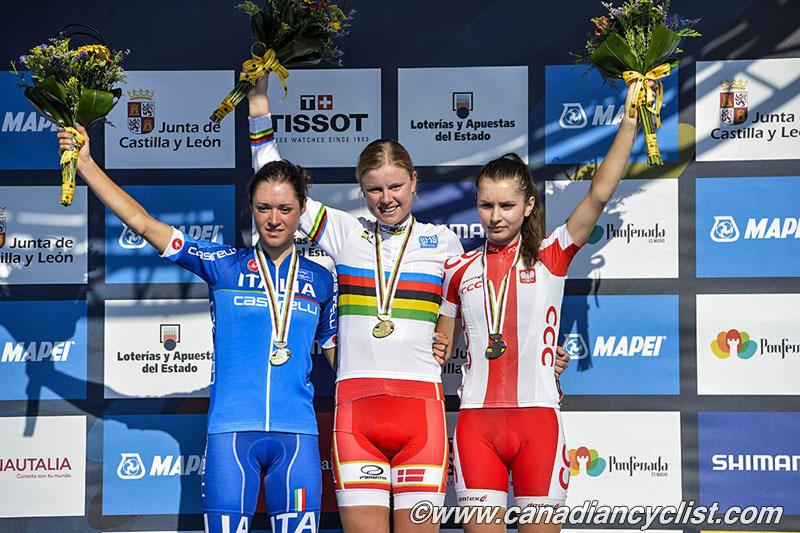 The other three Canadians - Harvie, Dafne Theroux-Izquierdo and Laurence Dumais - all stayed in the main group as it shrunk. Harvie finished 19th at three seconds, Theroux-Izquierdo 28th and Dumais 33rd, both at 15 seconds. "The first two laps I wasn't comfortable in the pack," explained Harvie. "I kept cycling through to the front and then falling back again. For the final two laps I had figured it out and could relax a bit. There were no attacks getting away, so I figured that it would come down to a sprint. It came down to a sprint group which I was at the back of. I got cut off, and in the final 300 metres just couldn't hold my sprint very well. But I'm happy, my climbing was there and I was able to follow the attacks. I just have to work on my sprinting." The men's race was considerably more aggressive, with three riders breaking away by the second lap - Sebastian Schonberger (Austria), Adil Barbari (Algeria) and Roman Kustadinchev (Russia). While the gap would grow to over two minutes, Australia was firmly in control, and pulled the break back as the riders tired. A second, more dangerous group of six formed by lap eight, containing Willem Jakobus Smit (South Africa), Lennard Hofstede (Netherlands), Tilegen Maidos (Kazakhstan), Jose Luis Rodriguez (Chile) and Ruben Zepuntke (Germany) and Pierre-Roger Latour (France). They were chasing a solo leader, Louis Meintjes (South Africa). But Australia steadily pulled back the riders off the front, and the smaller peloton was mostly together for the start of the final lap. Brayan Stiven Ramirez (Colombia) got a gap on the climbs, but it was Norway's Sven Bystrom who exploded off the front on the final climb to quickly catch and drop Ramirez. He stormed down the descent back into town, with an 11 second gap at 1500 metres. Turning the final corner, Bystrom was able to look back at 200 metres and see that he had enough of a gap to coast across the line with his arms in the air. Australia took silver in the field sprint with Caleb Ewan, and Norway scored a second medal with a bronze by Kristoffer Skjerping. In fact, they also took fifth, for a thoroughly impressive showing.